World Chess Federation (FIDE) has announced its ratings for February 1, 2018. 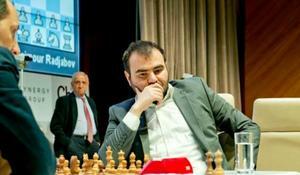 Azerbaijani GM Shahriyar Mammadyarov climbed to third place in the year’s last FIDE rating list. Azerbaijani grandmaster Teymur Rajabov has claimed the bronze medal at the 2015 FIDE World Rapid Championship. Magnus Carlsen, reigning World Champion from Norway, has won Shamkir Chess 2014 tournament that commemorated Azerbaijan’s late grandmaster Vugar Gashimov. Vugar Gashimov Memorial's last games will be held in Shamkir, Azerbaijan, on April 30. The grandmasters left behind the eighth round of the Shamkir Chess 2014 international tournament. An interesting football match has been held within the framework of the Shamkir Chess 2014 international chess tournament, which is dedicated to Azerbaijan's famous grandmaster Vugar Gashimov. The Norwegian chess player Magnus Carlsen successfully played against American Hikaru Nakamura during the seventh round of the Vugar Gashimov Memorial on April 27. Azerbaijani grandmaster Teymur Rajabov defeated the reigning World Champion, Norwegian Magnus Carlsen in the fifth round of the Vugar Gashimov Memorial, held on April 24. Italian Fabiano Caruana defeated tournament leader Magnus Carlsen during the fourth round of the Vugar Gashimov Memorial, held on April 24.